Summary: The description, specs, photos and pricing of the SIG Sauer P365 pistol. The P365 with the extended-grip magazine. two 10-round double-stack magazines, one flush-fit and one with an extension for your pinky finger (SIG also offers a 12-round extended magazine). Note: The P365 is rated for 9mm +P ammo. Retail: $499 @ Brownells—CLICK HERE TO PREORDER NOW! The P365 from the right, again with the pinky-extension magazine. 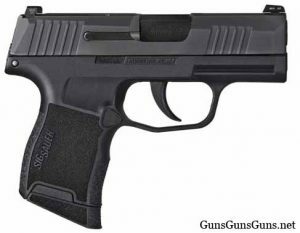 This entry was posted in $501-$750, 9mm, Semiauto, SIG Sauer, Subcompact on January 27, 2018 by Staff. Great gun, but finding a nice leather holster for the P365 is like trying to find a needle in a haystack. There are kydex holsters for it out the wazoo, but hardly any good leather. I found this place and have an order pending for a nice tuckable IWB model: http://www.gunnersalley.com/sig-p365-holster/. 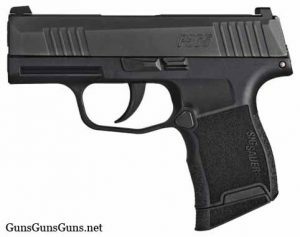 I should have it in the next few weeks, and it’s supposedly molded specifically for the P365.